Secant pile walls are formed by constructing intersecting reinforced concrete piles. The secant piles are reinforced with either steel rebar or with steel beams and are constructed by either drilling under mud or augering. 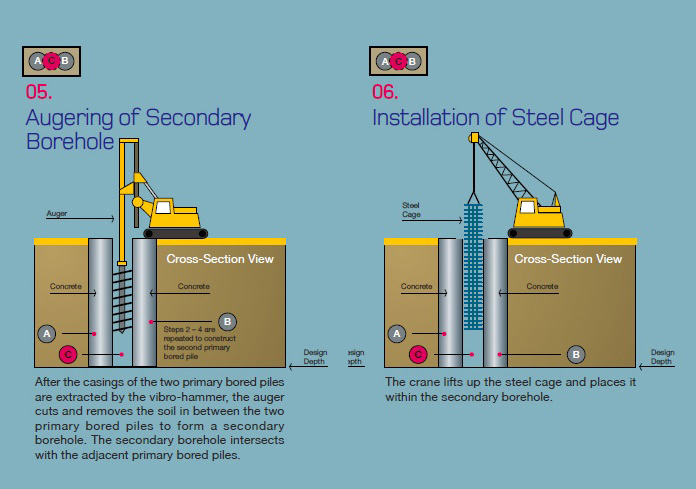 Primary piles are installed first with secondary (male) piles constructed in between primary (female) piles once the latter gain sufficient strength. Pile overlap is typically in the order of 3 inches (8 cm). 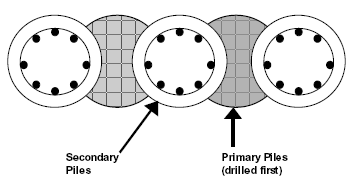 In a tangent pile wall, there is no pile overlap as the piles are constructed flush to each other. Secant pile wall design when steel beams are used involves the use of weaker than normal concrete. The pile that is lagging the wall between two main beams has to be examined for shear and compression arching. They are can not be used in high groundwater tables without dewatering. Where short term water retention is required this system offers the most cost-effective and rapid solution. The wall consists of interlocking bored piles. 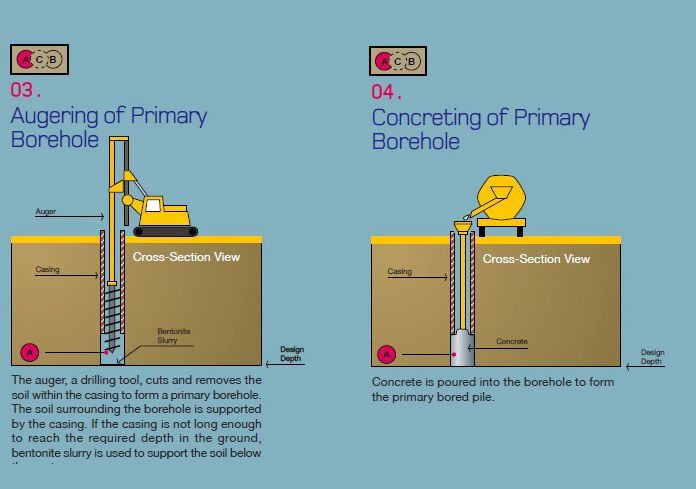 Primary piles are constructed first using a ‘soft’ cement-bentonite mix (commonly 1N/mm2) or ‘firm’ concrete (commonly 10N/mm2). Secondary piles, formed in structural reinforced concrete, are then installed between the primary piles with a typical interlock of 150mm. These walls may need a reinforced concrete lining for permanent works applications, depending on the particular requirements of the project. 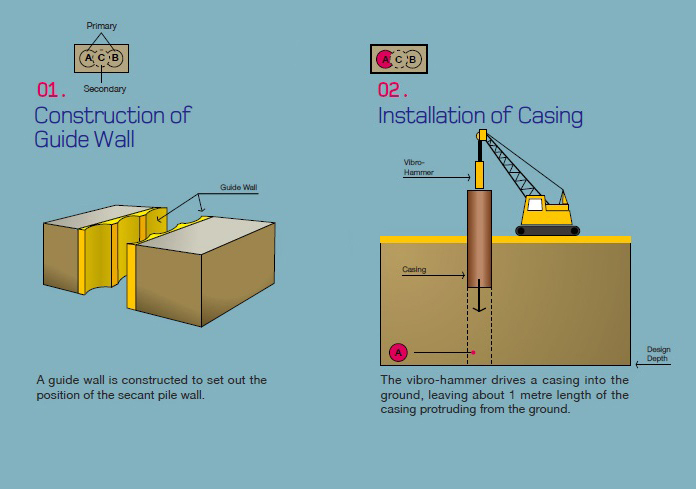 Hard/hard wall construction is very similar to a hard/firm wall but in this case the primary piles are constructed in higher strength concrete and may be reinforced. Heavy duty rotary piling rigs, using tools fitted with specially designed cutting heads, are necessary to cut the secondary piles. Since structural concrete is used throughout there may be no need to provide a lining wall. 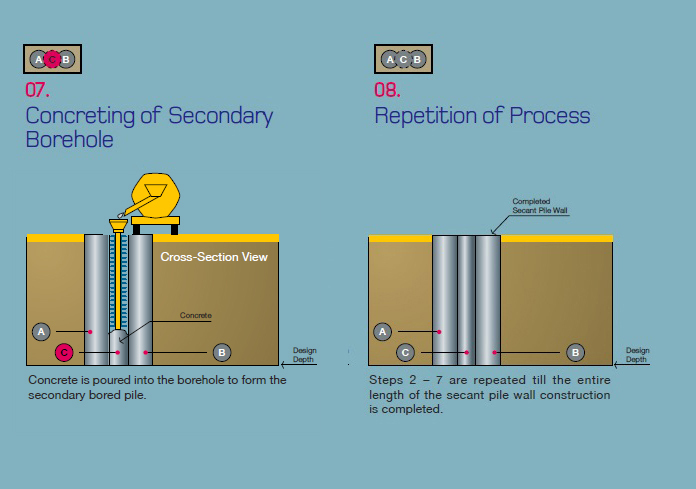 The end product provides a fully concreted face and can be an effective alternative to diaphragm wall construction.